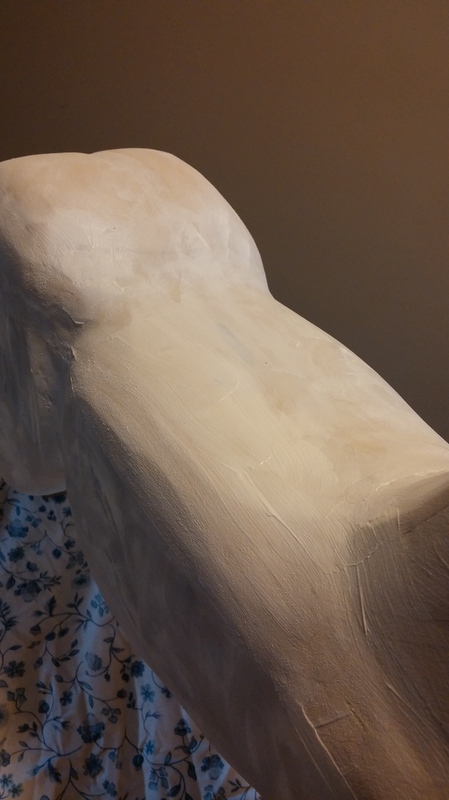 So, I’ve been curious about using a gesso layer under paint to aid in creating a smooth finish without cracks. 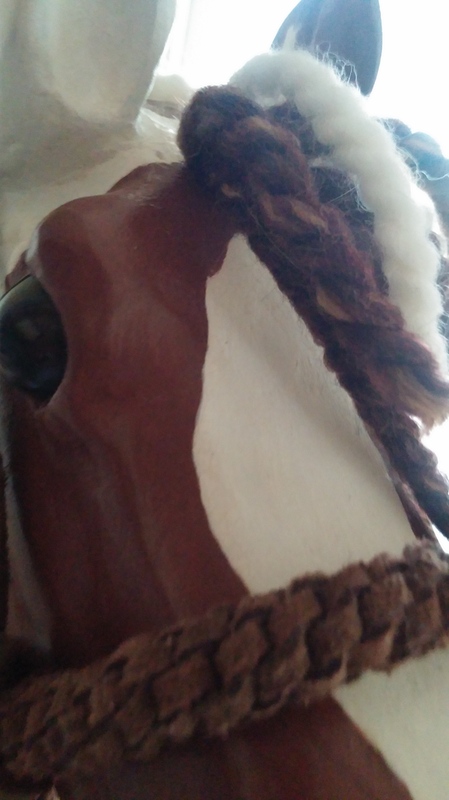 I decided to try it out on a horse that I am repairing. 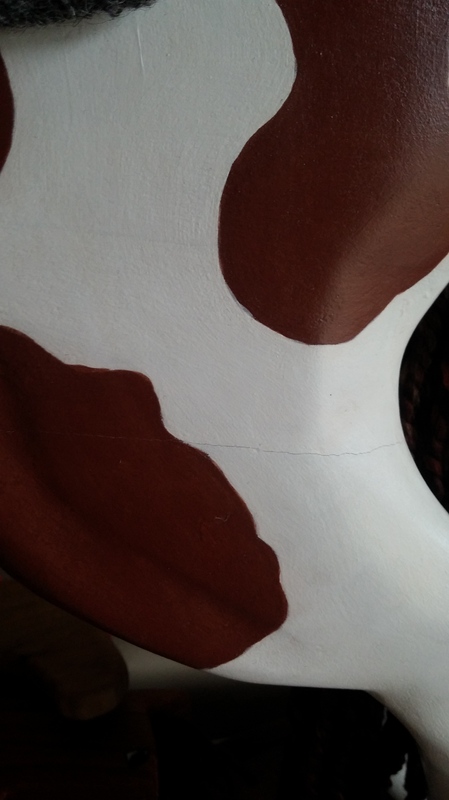 The original finish had many cracks, and the joints of the wood had opened up. 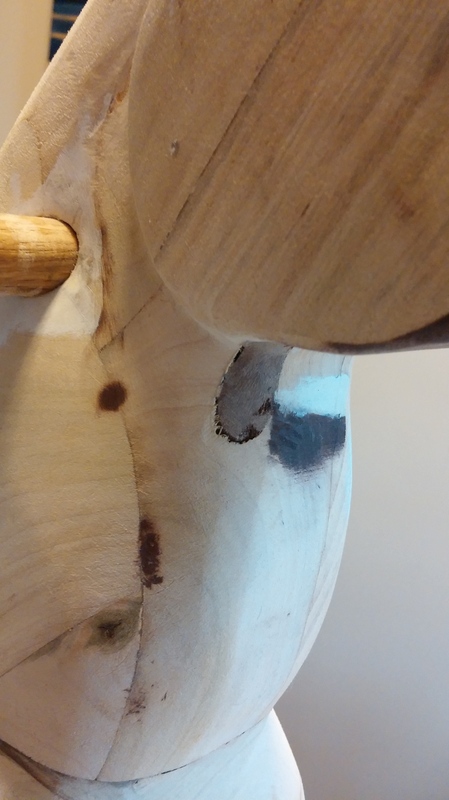 There were many defects in the wood surface that I hoped to fix. 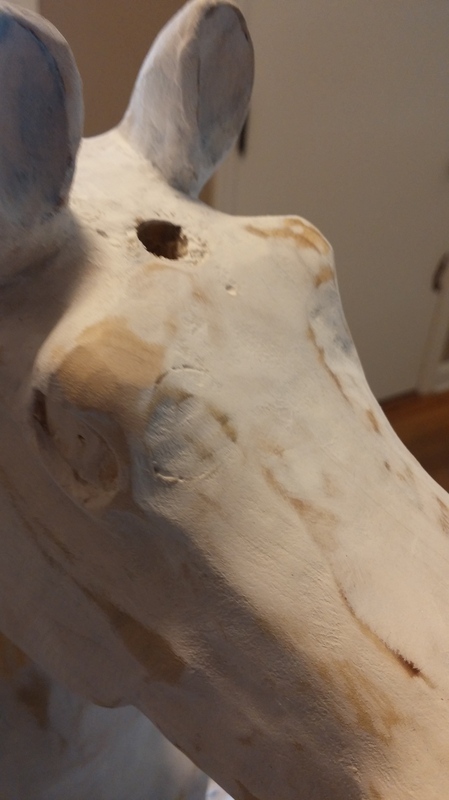 My hope was that the gesso would help seal everything and prevent more cracking. The end result? I don’t think it helped much, at least not enough to do it again. I used an acrylic gesso, so maybe a natural old-fasioned gesso would be more effective. The traditional kind has plaster of paris in it, I think. 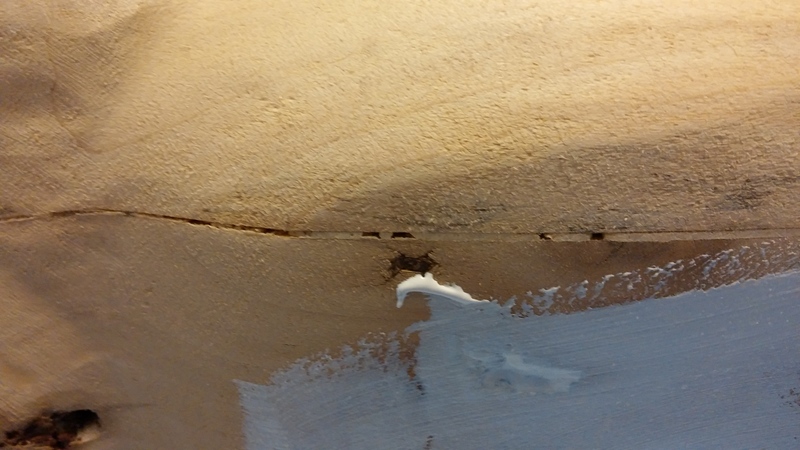 It seems gesso does create a super smooth finish, if you don’t have cracks in the wood. In that way it would work really well for what most people seem to use it for- as a smoothing layer on painting canvas. But for wood, it just didn’t help me. I used Liquitex Basics Acrylic Gesso. It has the consistency of maybe yogurt? Pretty thick. I had high hopes that it would provide a good thick layer. It goes on fairly easily. I ended up with a thick coat with a lot of brush texture left in it. 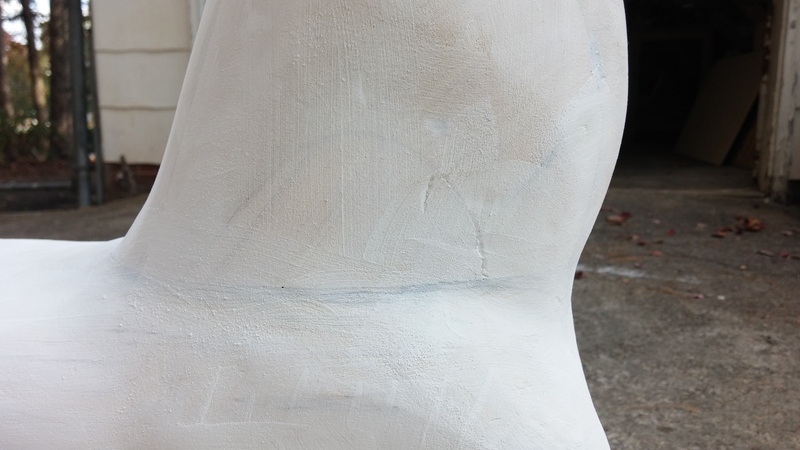 I planned to sand this out later, hoping a thicker layer would provide more filling of the cracks. 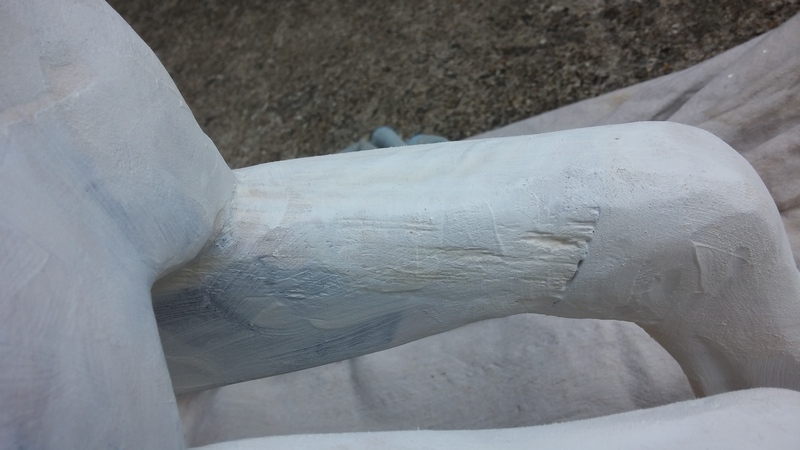 You can see it does appear to fill in many of the defects with the first coat before sanding. 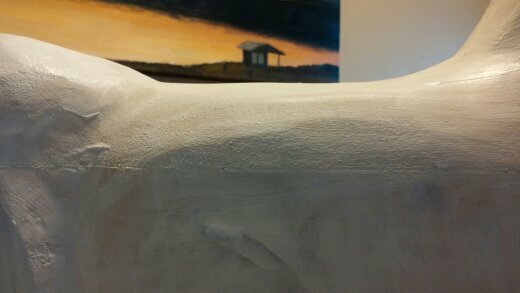 After allowing the gesso to dry 24 hrs, I sanded it by hand. This was kind of dusty and I wore a mask. 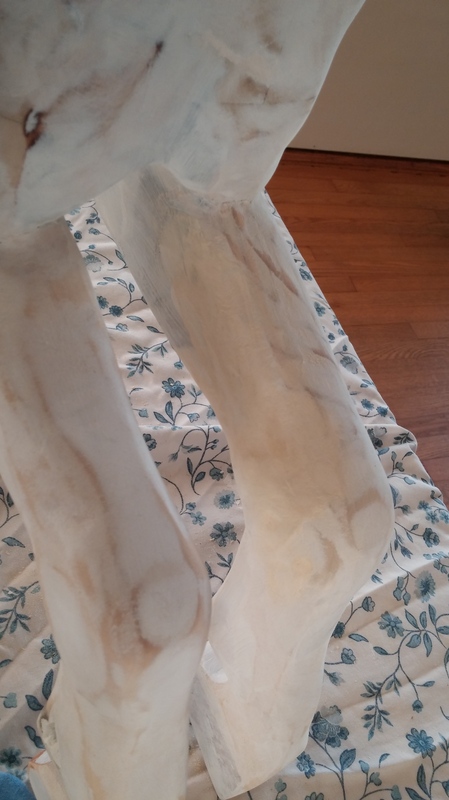 After sanding, I was disappointed to see that many of the defects had already opened back up again. The gesso didn’t work as an effective filler the way I had imagined. 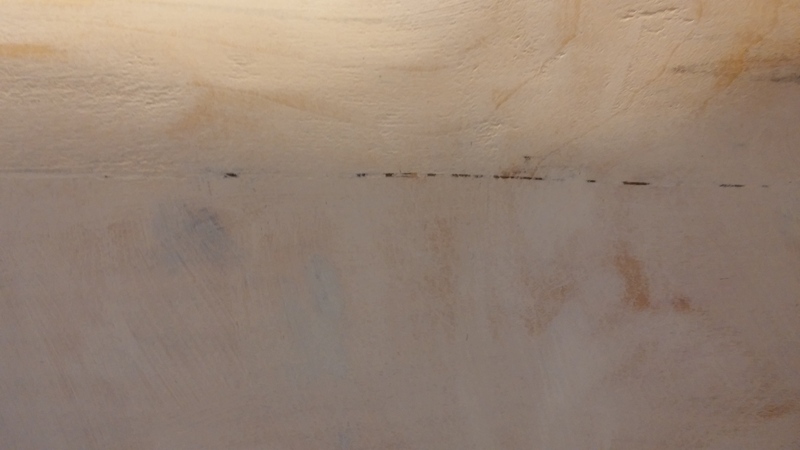 Here’s some sanded images…If you can see, some very small seams were filled, but the large defects still stand out. After a final sanding, this did provide a pretty good surface. 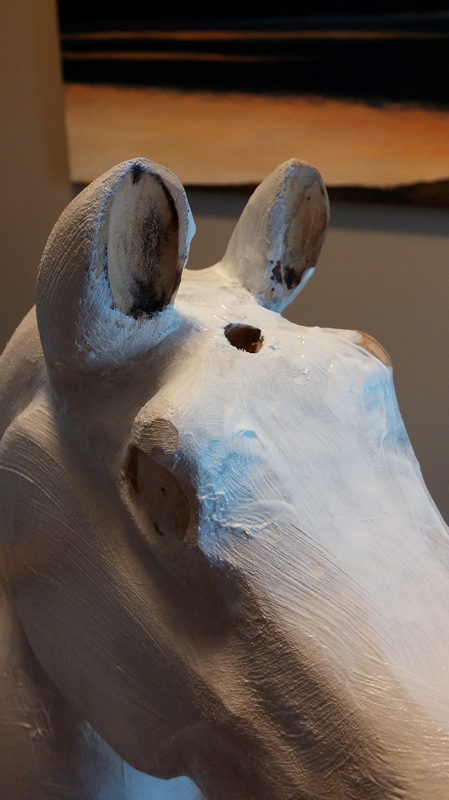 But again, I think the better process would be to use wood putty first, then sand, then gesso, then sand again. After I applied paint, many of the puttied areas flaked off. I didn’t get any photos of this, sorry. 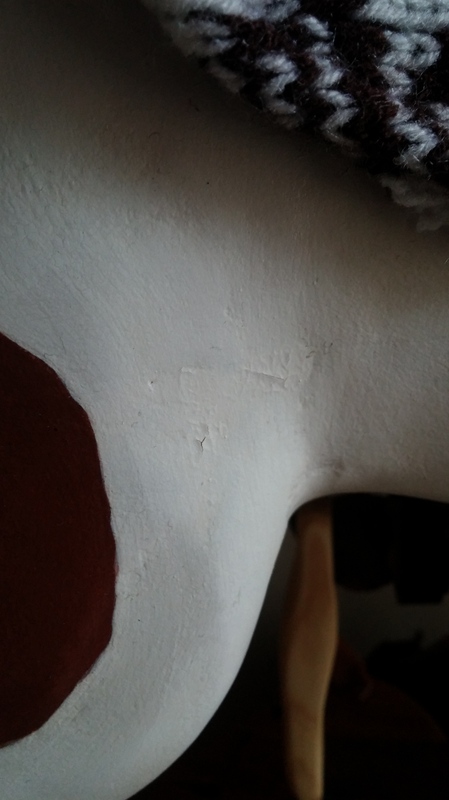 But I think the putty didn’t adhere well to the gesso, creating the problems after painting. What I may try in the future is to apply wood putty to areas that need it. Sand that smooth. Then possibly apply gesso, or I may skip gesso in the future. I don’t notice any benefits that a regular primer coat of my normal milk paint doesn’t already create. I think I will just stick with milk paint in the future. 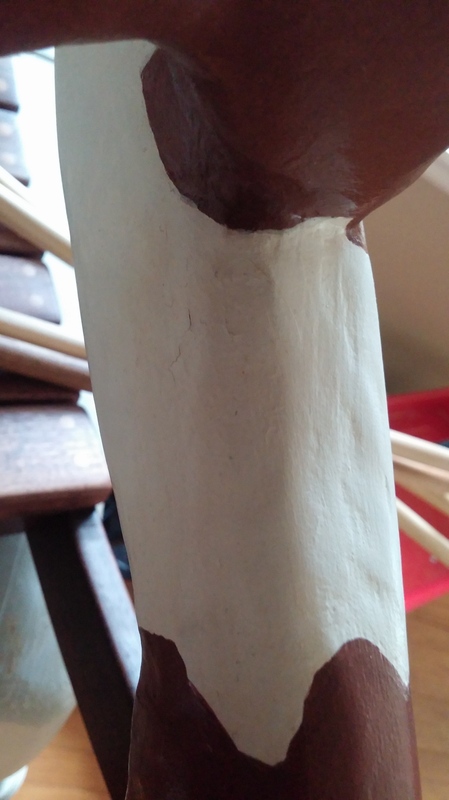 Maybe I didn’t use the gesso correctly, or didn’t use the right kind, or shouldn’t use it with Durham Putty, or it doesn’t work well with milk paint. I called the milk paint company and they said it usually works great with gesso, so I don’t think that’s the issue. But for now, I just don’t see the benefit of using it. 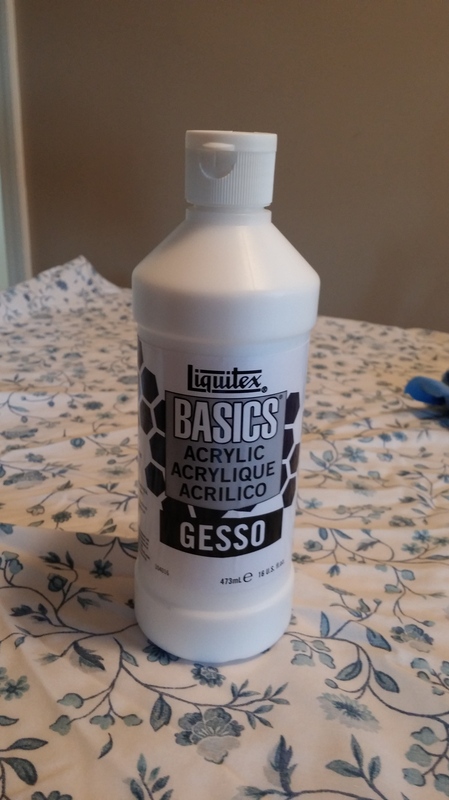 Let me know if you have had other success with gesso! There’s plenty of differing opinions about how much oil and how much wax to use in the mixture. I’m not sure if there’s a right or wrong answer to this, but I’ve found something that works for me. I use a 1:2 ratio of wax to oil. You might like more or less wax, depending on your process. What I like about the 1:2 ratio is that it is a soft solid at room temperature. 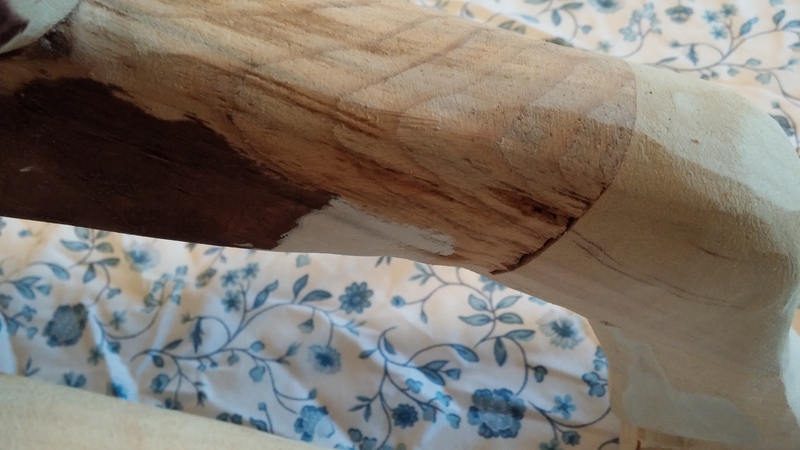 It can be scooped up by a rag and smeared onto the wood surface without much effort. You don’t have to heat it to get it out of the jar. 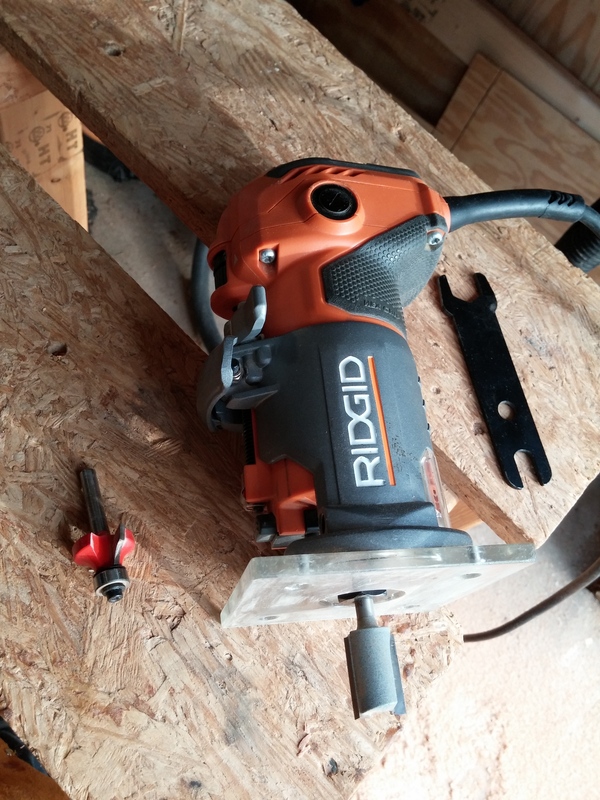 This makes it easy to work with, and it doesn’t run everywhere. There are a few tricks, though, more on that at the end of the post. I mix everything in a 1 pint jelly jar, which happens to have little markings on the side…I think some of them are in ounces. So I fill it with 2 oz. melted wax, and 4 oz oil. Here’s how. I start with solid bees wax. You can purchase this from many bee keepers at a market, online, or in various stores in various forms. Just be sure to look for 100% bees wax if you are trying to stay natural and non-toxic. You also want it clean and filtered. 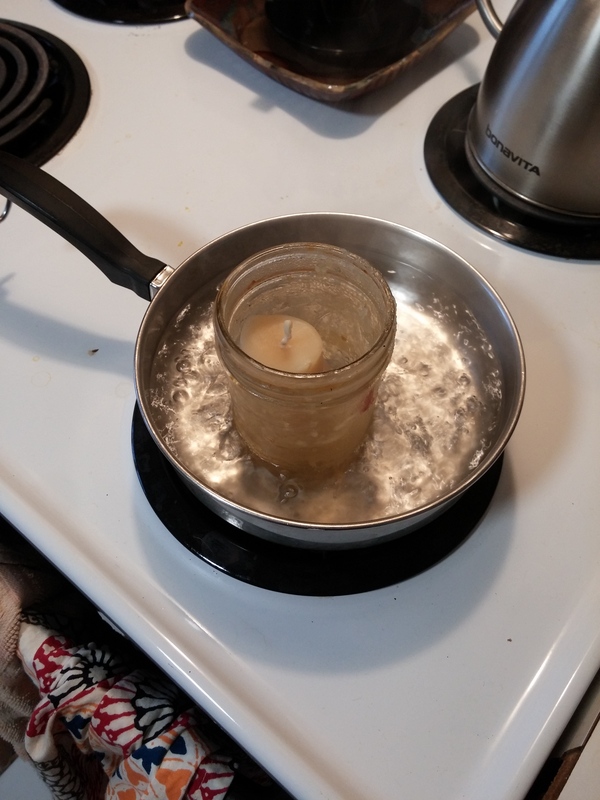 I have a little candle that is wax that I’m melting down to use for my mixture. You need to melt the wax in a water bath. This is to avoid direct contact of the jar or the wax with the stove, which would be dangerous! So, just place a pan of water on the stove and put your jar in it. 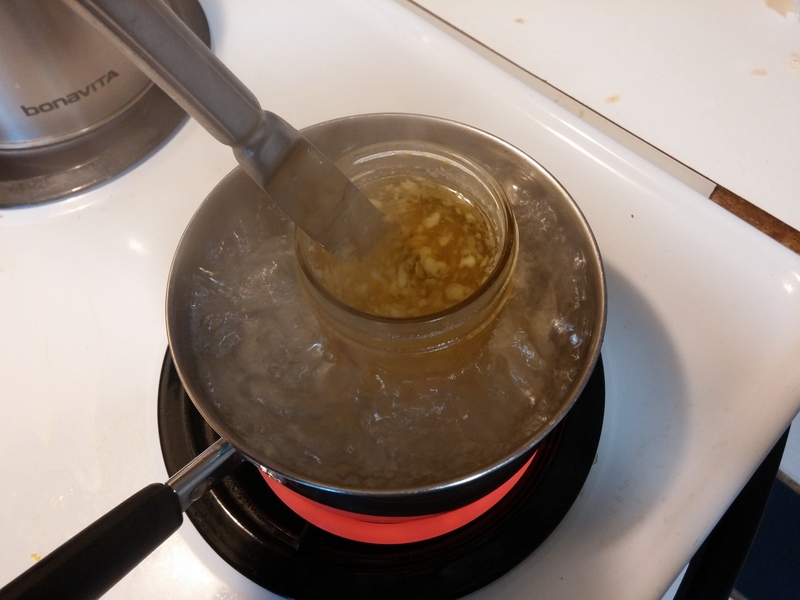 You can use enough water to cover about half the jar to aid in heating the wax. I don’t use more because I don’t want water to get in there. Bring the water to a boil and use fairly high heat to speed the process along. You don’t have all day, right? This takes about 10 minutes. Some people like to shave the wax, but I find this takes longer and is messier and more difficult. I just sit the candle in the jar and use high heat and it melts pretty quickly. 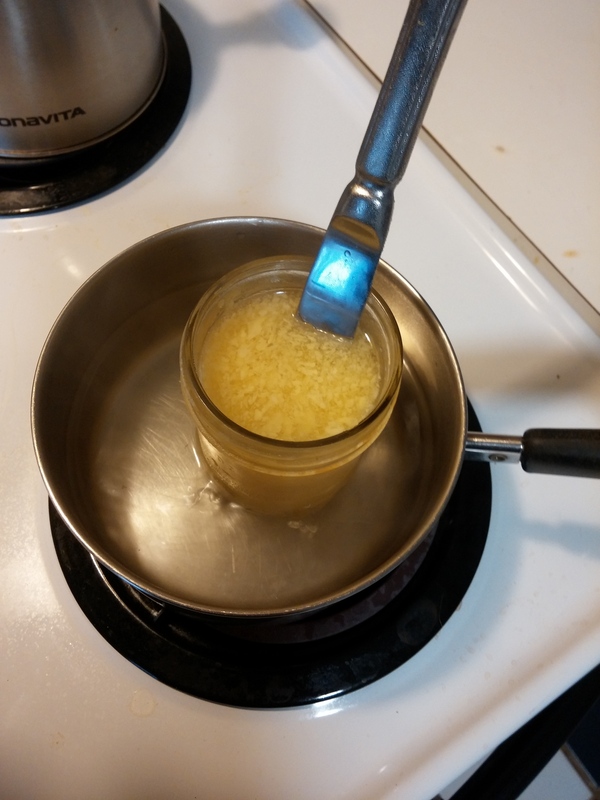 As it melts, I occasionally check the amount of liquid that is accumulating by removing the jar and the candle and looking at the side of the jar. The wick from the candle makes this super easy to just lift the candle out and check the volume of the melted wax. When the liquid reaches the 2 oz mark on the side, I’m done. Remove the rest of the solid wax and save it for next time. 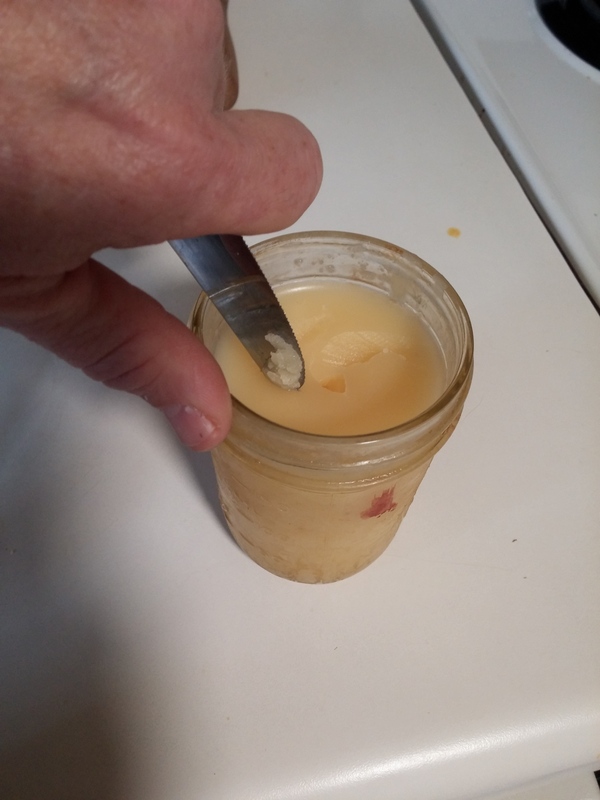 You should be left with just plain liquid wax in the jar. Next you want to add oil to the mixture. I use linseed oil, and I use all natural polymerized linseed oil from Tried and True brand. It’s their natural danish oil that has been partially dried, so it contains more solids and dries faster. You can use raw linseed oil, but I figure the more dry, the better. If you want to stay non-toxic, don’t use boiled linseed oil, it has heavy metals in it. And don’t use mineral/baby oil, it’s made from petroleum. But walnut oil, almond oil…other oils are fine. I’ve stayed away from orange oils because I’m not sure how skin friendly they are. They are used as a degreaser, so they might irritate the skin. Or they might be fine, I’m not sure. *Side Note: If you have time, you can also “polymerize” your own linseed oil. Start with raw oil, which is greenish in color and will take ages to dry on your wood. Leave it sitting out in a wide container like a 9x13x3 baking pan, so that it can air dry. You have to leave it out for like a year, people, this takes a long time. But you don’t have to do anything with it. After a while, the oil will change from greenish to light honey brown. It is ready to use now and will dry faster when applied to your wood. I use one 32 oz. jar for one year while my next jar is drying for the next year, so I never run out. Or I just order Tried and True polymerized linseed oil that’s ready to go. Ok, so, pour in enough oil into the jar with the melted wax to reach the 6 oz. mark, so you’re adding 4 oz of oil, creating a 1:2 ratio of 2 oz. wax to 4 oz. oil (right? that’s how ratios work, isn’t it?). 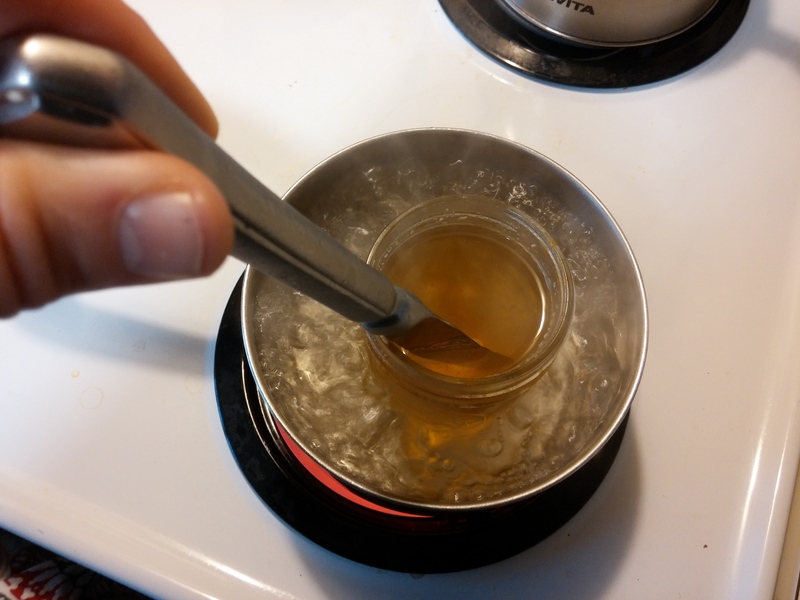 The mixture will be cloudy at this point because of the cold oil, and it isn’t fully mixed. You will need to heat everything together so that it is uniformly incorporated. You can add more water to heat it faster, just keep it out of the jar. Here you see the solids are just small pieces. Keep stirring till everything is completely liquid. Once you have liquid, you’re done! Just take it out to cool, and the whole jar will become solid again. It has the consistency of hard butter. A soft solid you can still scoop out from the jar. You shouldn’t need a knife, I usually just scoop it out with my finger and a rag. So this is just what I’ve found to be quickest, and most effective against wood cracking. First apply 1 to 3 coats of oil to your wood piece. Again, I use a natural, polymerized linseed oil. Allow each coat to dry 24 hrs and wipe away any excess after an hour, or 10 minutes if you are impatient like me. 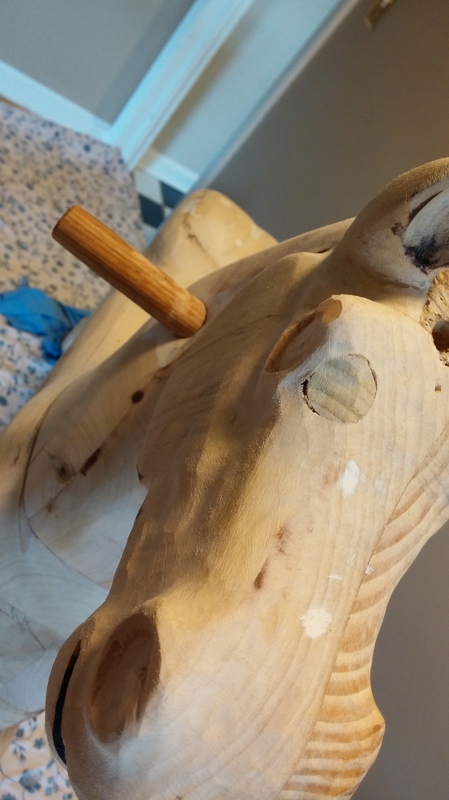 After those oil coats, scoop out some wax mixture and wipe it generously into the wood. (I’ve done this immediately after applying one coat of oil, with good results, but more oil will be more protection). It will look like goopy clear butter, and you should see some excess built up on the wood. I used to try to wipe everything in really well, and wait for it to dry naturally. This doesn’t work! 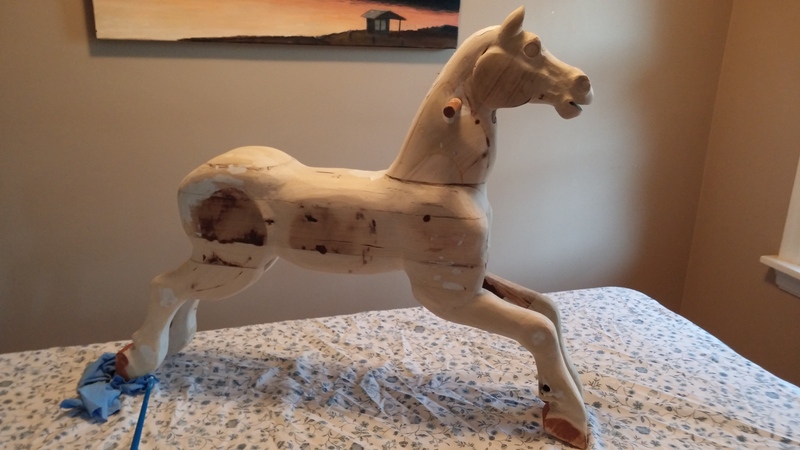 It will take like a year for this to dry, and you will have a tacky, icky waxy finish. What I learned was to wipe it on heavily, like I said. Just be messy. Then, here’s the trick: Use a hair drier to warm the wax and melt it into the wood. The heat will draw it into the wood, I think, and also thin everything out to a uniform covering and dry it. While it’s hot and liquid, wipe off any excess with a dry cloth and buff rapidly for several seconds, by hand, until you feel the surface become slick and dry. That’s it! It should be dry and soft to the touch. I think this heating process just makes the wax thin enough so that it will actually dry quickly. 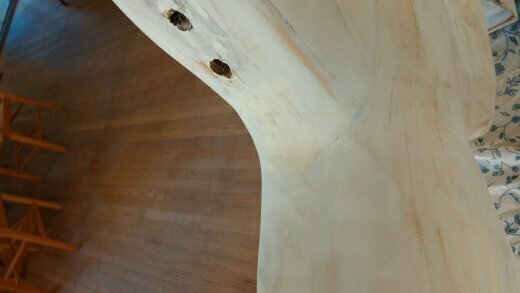 This finish has worked well for me in preventing the wood from drying out, cracking, or getting moisture damage. You can use a few more coats of wax if you want more protection. You can also rub more oil in each year to maintain the finish, though I’m not sure the oil makes it through the wax into the wood. 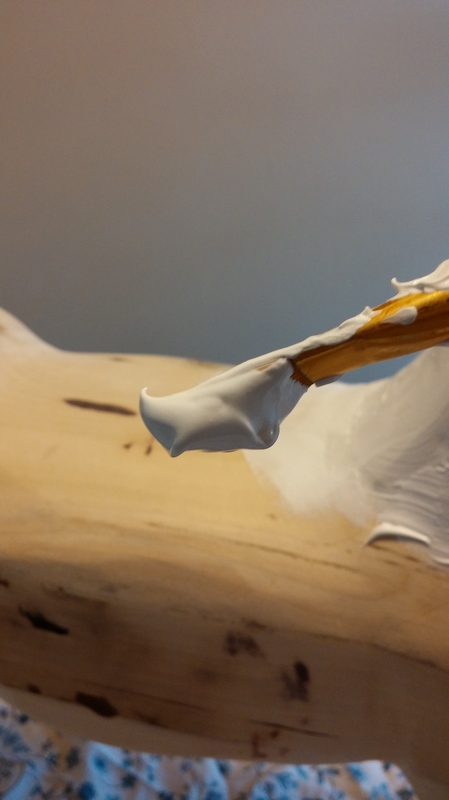 You hopefully are just building up beautiful natural layers of oil to your natural finish. I’ve been thinking of using more wax in the mixture, just curious what that would be like. Experiment for yourself! The best thing about all this is it is safe, you can just use your bare hands and apply everything inside the house if you want. No fumes, no sprayer, easy! I hope this works well for you! This has been a long post, but really this is a super fast process. It takes about 10 min to create the mixture, and about 1 minute to apply. Besides waiting between coats of oil, the whole thing is super fast and super effective! Let me know how it works for you! 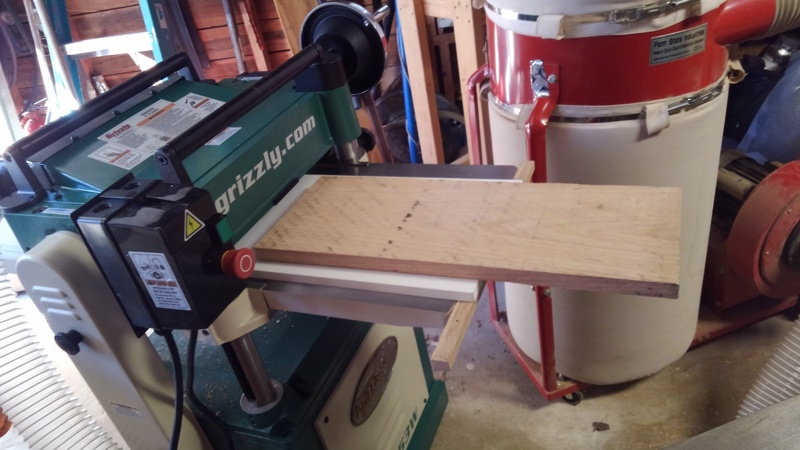 So, first off, I was awarded a grant to purchase a thickness planer, a major piece of equipment that most shops have from the start. I have been barely getting by without one, and am so happy to have it delivered already and put to use! Thanks to the Toe River Arts Council, Madison Arts Council, Asheville area Arts Council, and Avery County and the North Carolina Arts Council, a division of the Department of Cultural Resources for this grant! It does not matter! You can stop reading here. Just watch Jay’s video. The face is flat enough that you can use the bed riser as seen in Jay’s video just as you would if the rabbet created were 90 degrees. 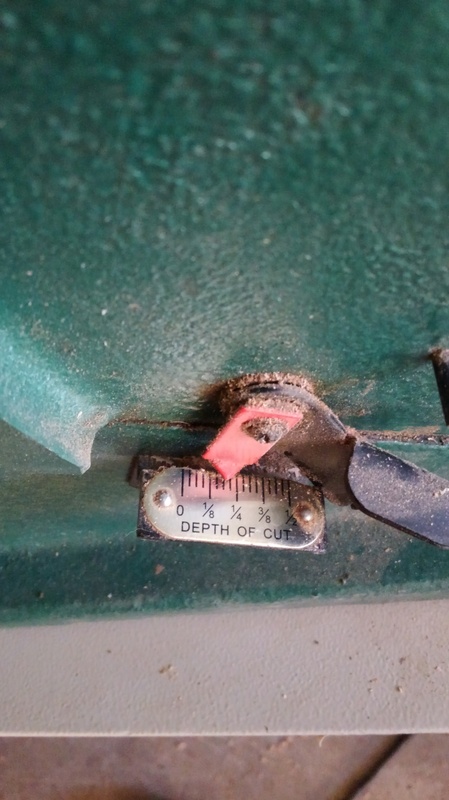 I found this out after trying to create another bed riser for my jointer, following the same principle as with the planer. 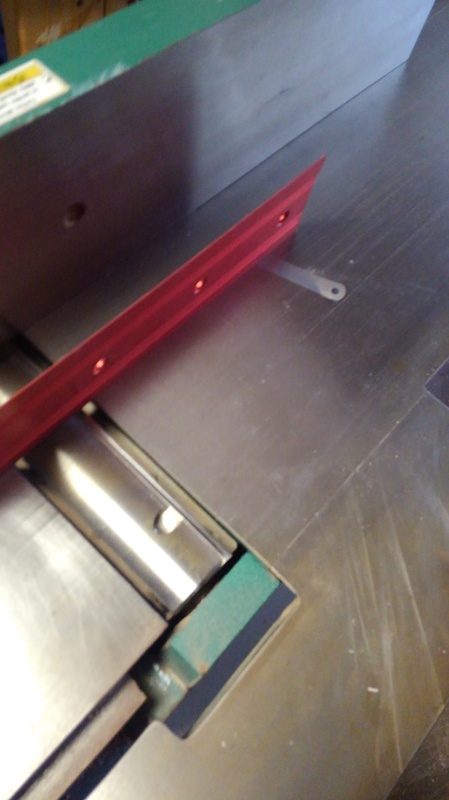 But I realized that this step was not necessary, and you end up removing about 1/8″ less material by skipping the jointer-riser bed step. If you are interested, here’s what I did at first to overcome this diagonal cut. I had planned to post about this before I realized the shortcut, so I documented it with photos. Step one-half- need to adjust my beds. And remove the blade guard. Be careful! I had previously shimmed my infeed table to make the beds parallel. 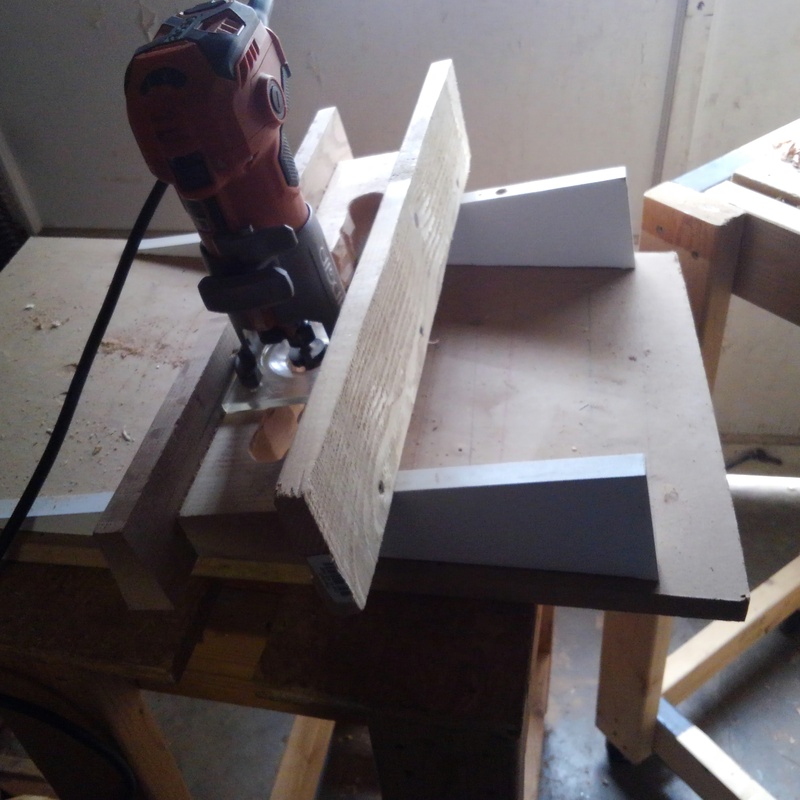 Since I will have to move the infeed table up and down to use this method, I decided to shim the outfeed table instead. There are many videos about this, but here’s a quick recap of what I did. 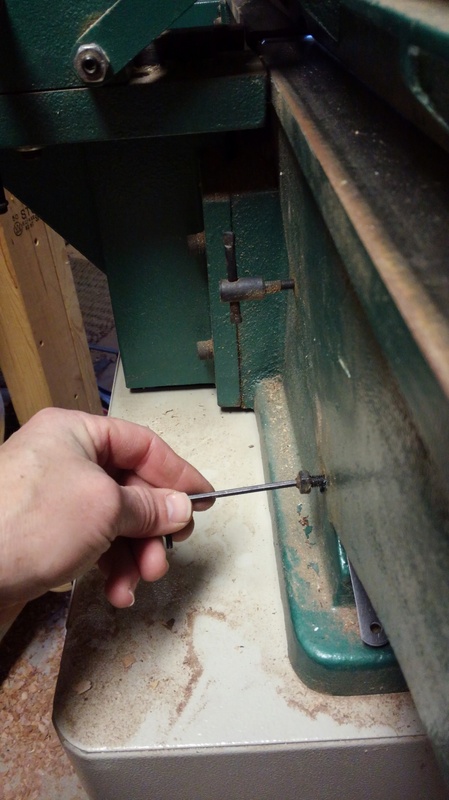 First, loosen the gib screw and the locking screw on the outfeed table. If needed, you can insert shims under the bed to raise the back of the table, making it parallel. I needed to shim .017″. Lock everything back tight and you are good to go. 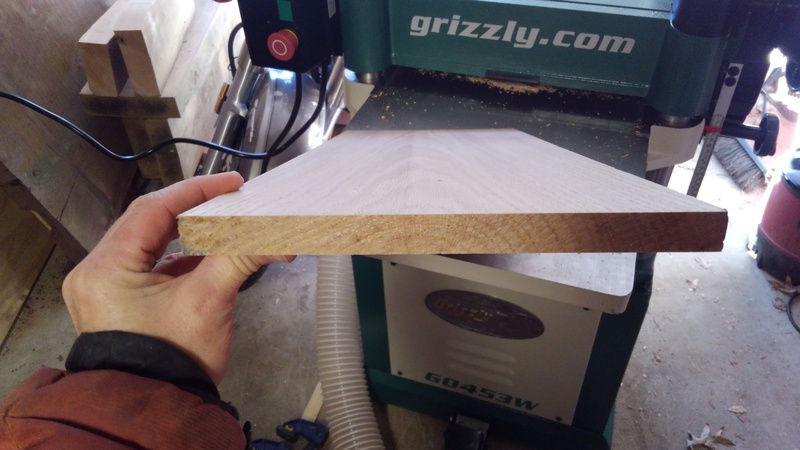 I cut a strip of luan board that was about 1/4″ more narrow than my cutter head. 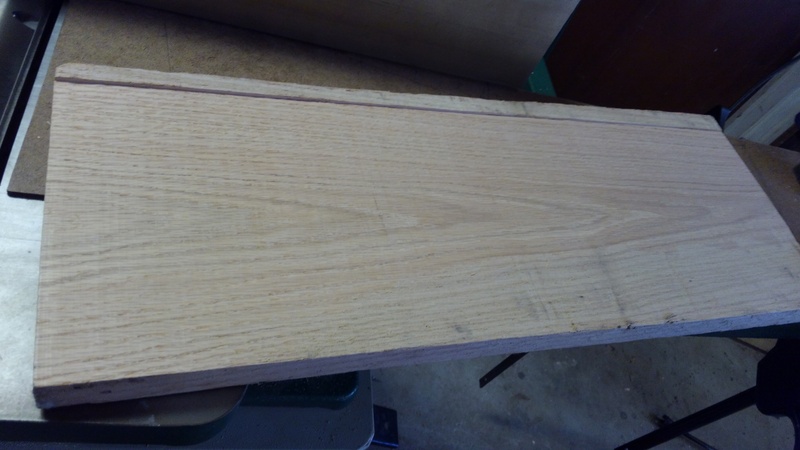 This board is about 1/8″ thick, allowing me to plane up to 1/8″ of material. 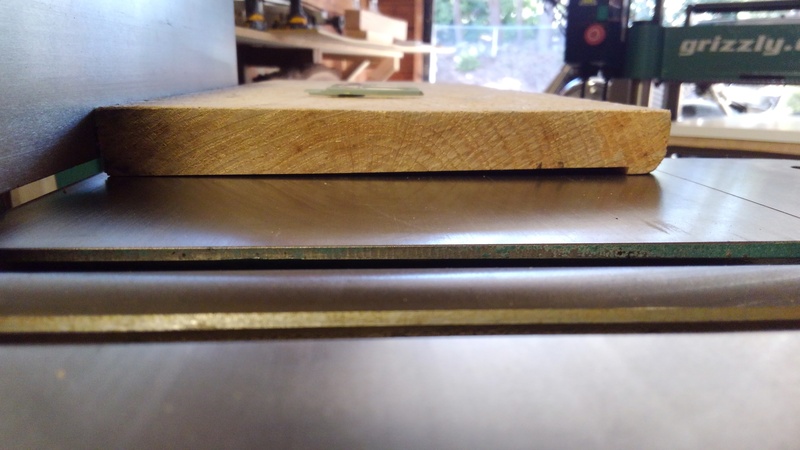 I would have preferred a board closer to 1/4″ but this is what I had that was flat and smooth. 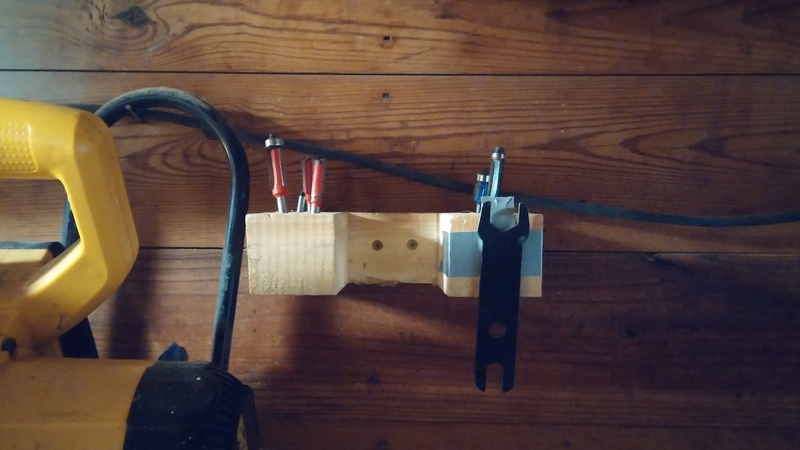 I simply clamped it to the infeed table at the far end. Step 3: set up the riser bed on the planer. 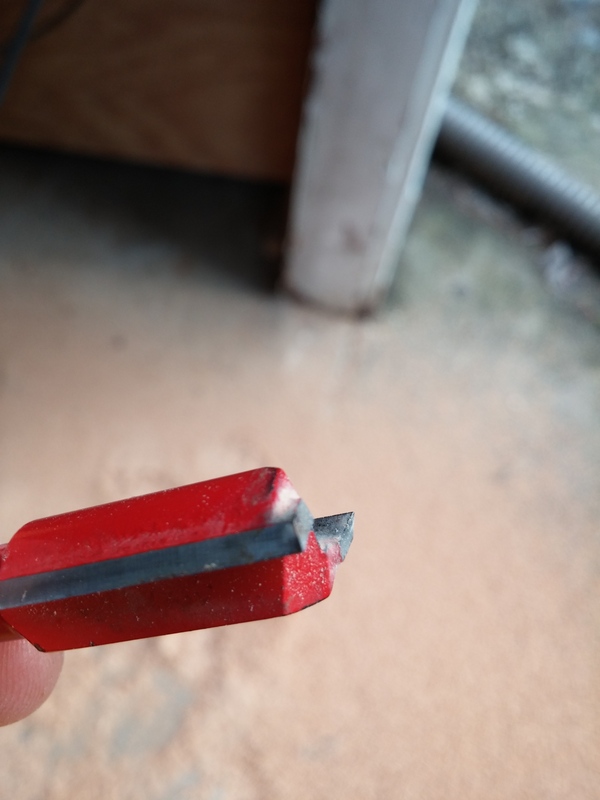 I just screwed a scrap piece of wood to the bottom of a 5/8″ shelf material. This material is slippery and really flat. It does have some give, but it will be supported by the planer beds. I had to sand the edges a bit to remove little raised burrs. 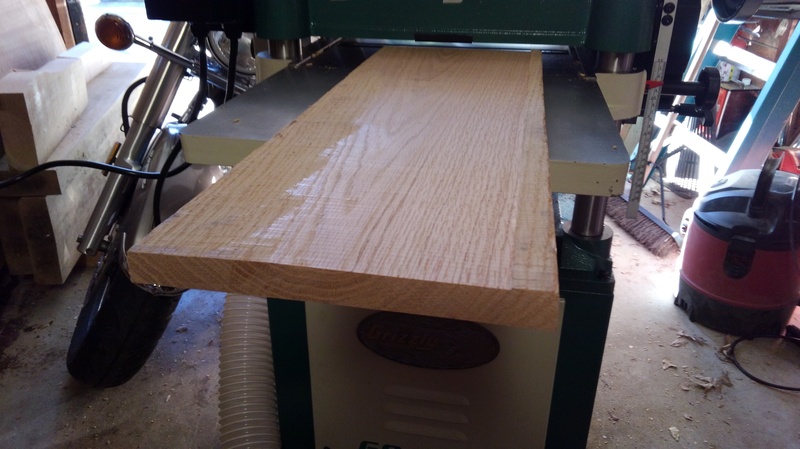 Here it is sitting in the planer. 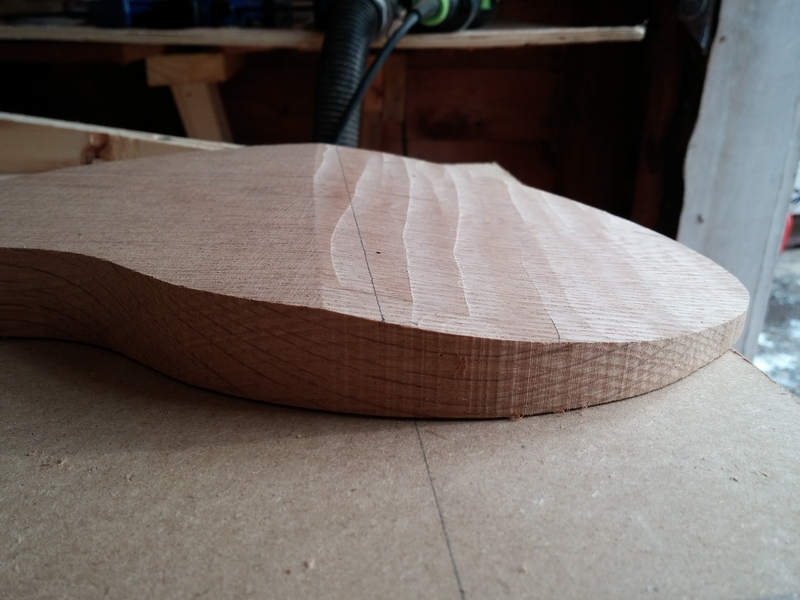 It needs to be more narrow than the planer to allow the rabbet edge to sit over the side of it. 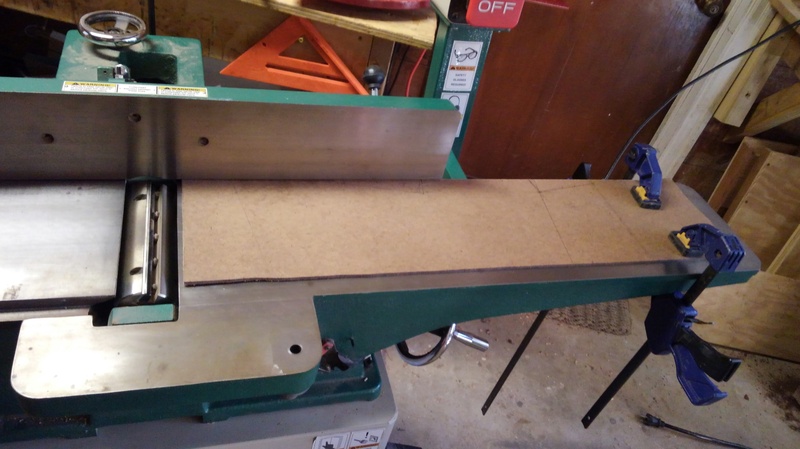 Step 4: run the board through the planer with rabbet over the side. I ran the board through until the entire face was flat. Didn’t take too long. This will remove the rabbet and create your 2 parallel faces. I also ran it back through with the other side up again, just to be sure it was all flat. 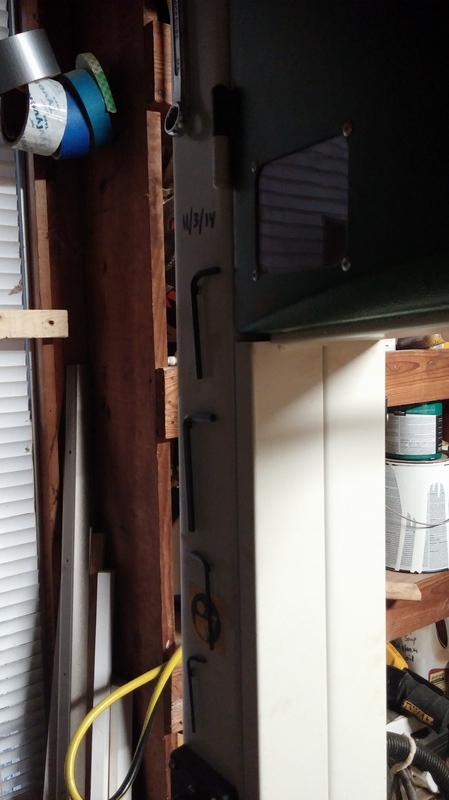 The final result was a flat board, but I lost about 3/8″ of material. 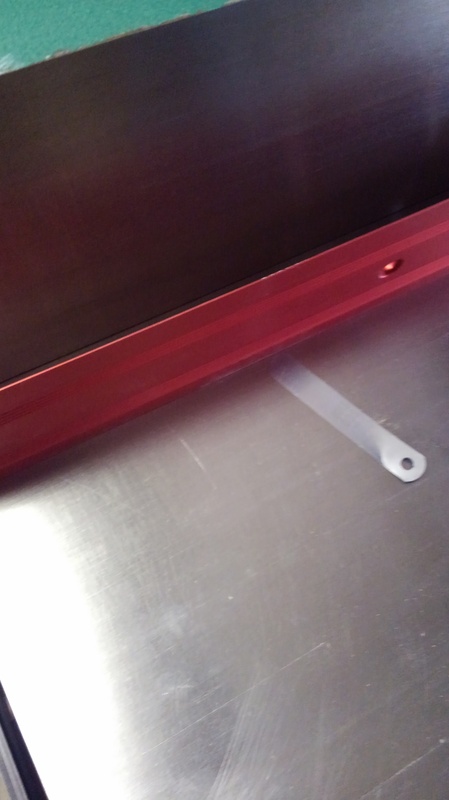 What I found was that I could skip the riser board on the jointer, and just create a rabbet that was at a diagonal angle. 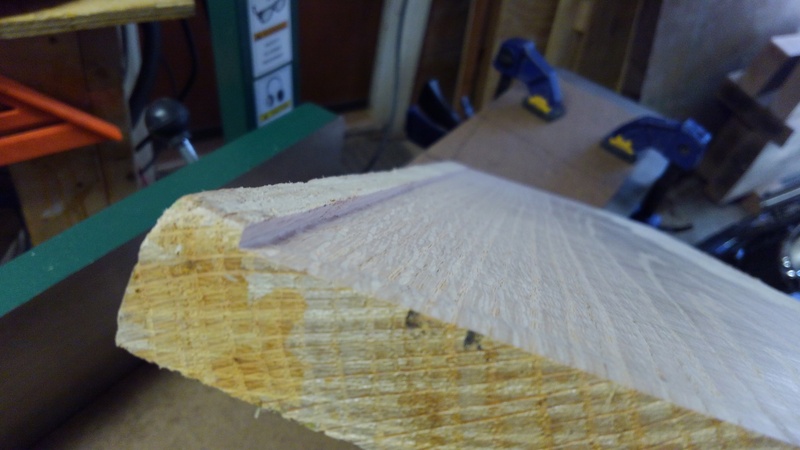 I could still run it over the riser board in the planer with the rabbet over the edge, and it all worked out the same. 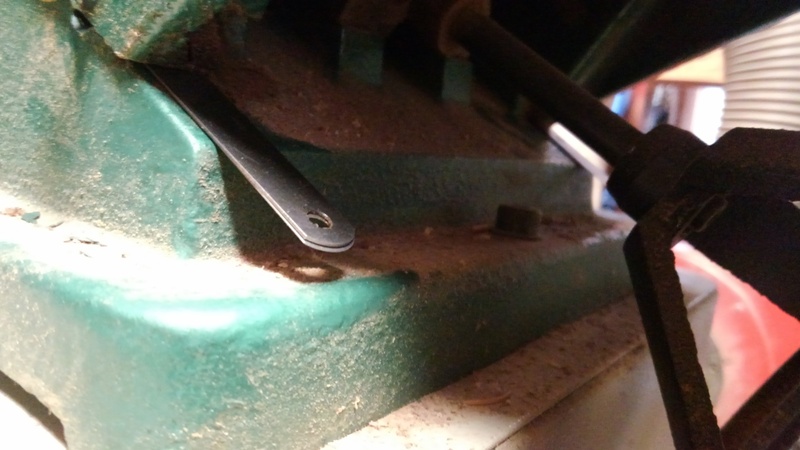 But without using the riser on the jointer, I removed less material in the end. 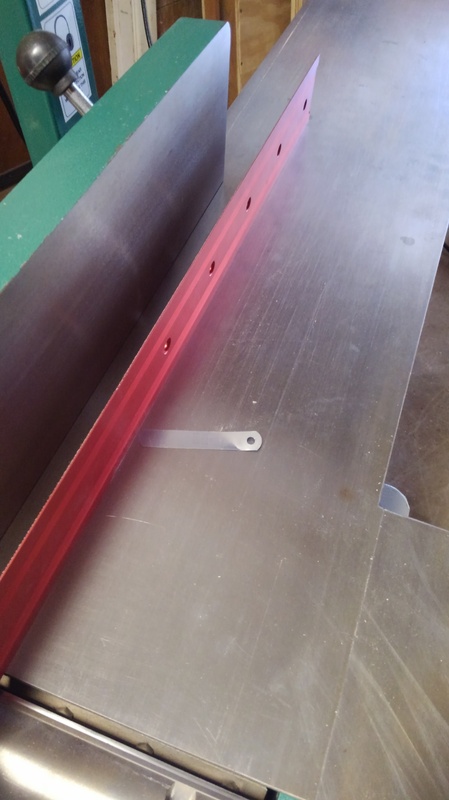 You can also avoid moving the infeed table around by skipping the use of the riser on the jointer. 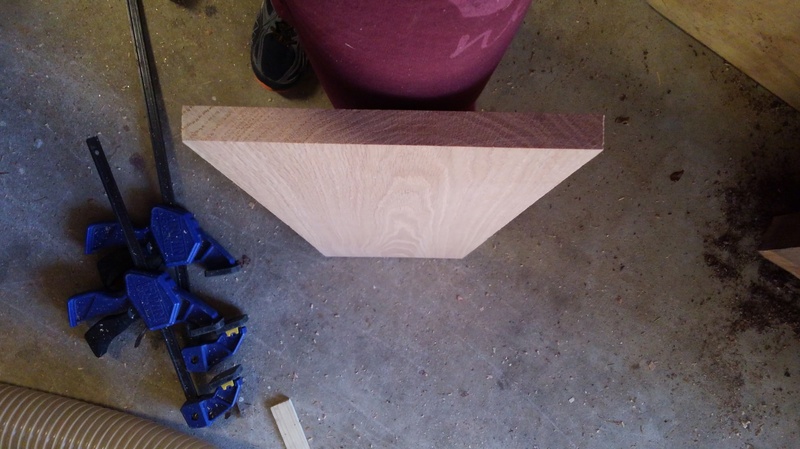 If you didn’t use the riser on the jointer, you will end up with a wedge shaped board in the end. 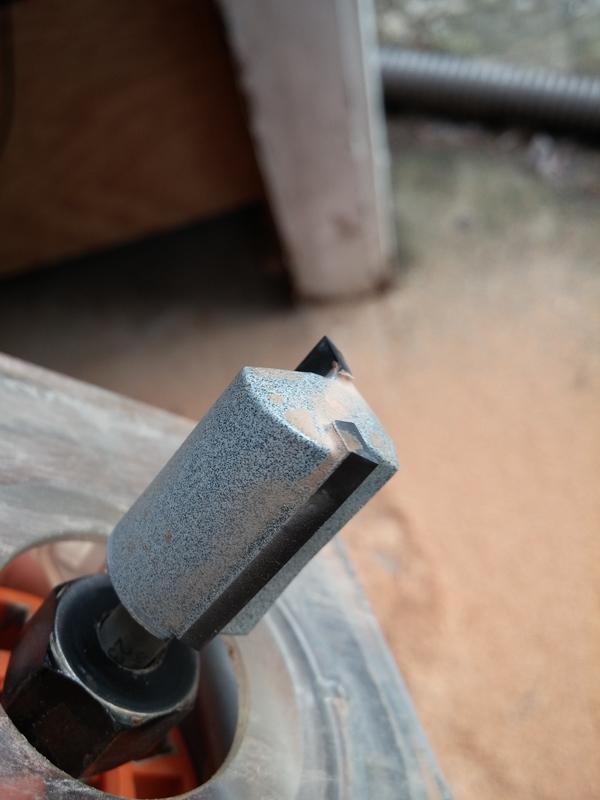 Not a big deal for me, I just ran it through the jointer at the end and got 90 degree corners all around. 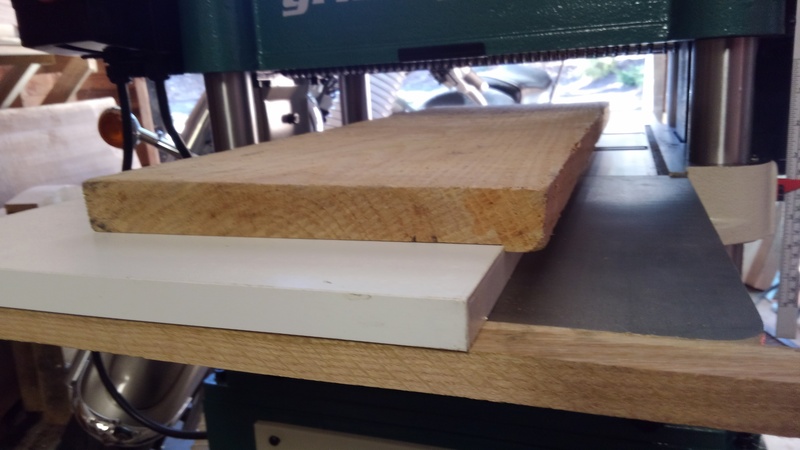 You can effectively joint a board wider than your planer by removing the blade guard, running it through the jointer to create a flat surface that looks diagonal, then running it through the planer using a riser bed with the rabbet over the edge of the bed. 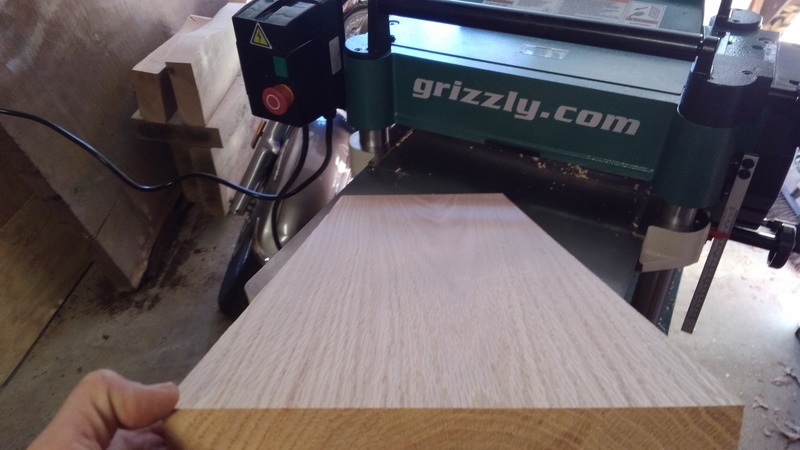 Finish it off by running it through the planer again on the flat surface you created. Then joint our edges and you’re done! If there is a problem with that first face being diagonal at first, I was not able to measure any differences in the final product that might suggest a problem. If you can think of any issues with this method, please post them below! Have fun! Ok, this is a really simple upgrade, and I wish I could have upgraded in a more elaborate way. But I do what I can. My favorite things right now in the shop are some new rare earth magnets that I have placed all over the shop. 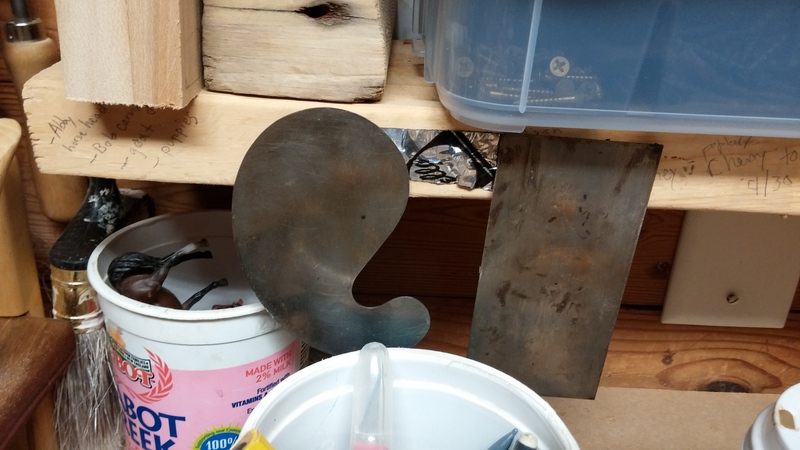 I bought them to make a magnetic mosaic set, made by slicing the tiles I’ve made in half and gluing the magnets inside…we’ll see when and if that happens…But for now, I’ve found a great way to store a few often used, and frequently misplaced, small metal items in the shop. 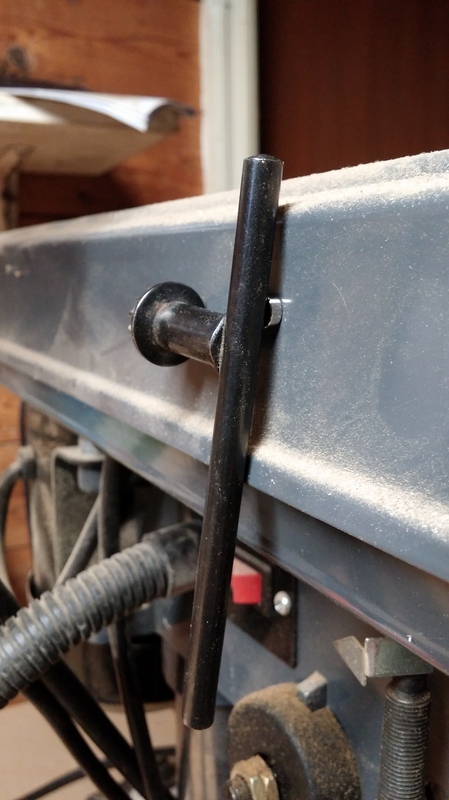 I can either stick a magnet directly on something, or tape a magnet to something wood by using HVAC tape. Here’s some photos, and short stories about how I used to store each item and how it is now “magnetted” (new word) in a new place. I hope you can use this idea too! 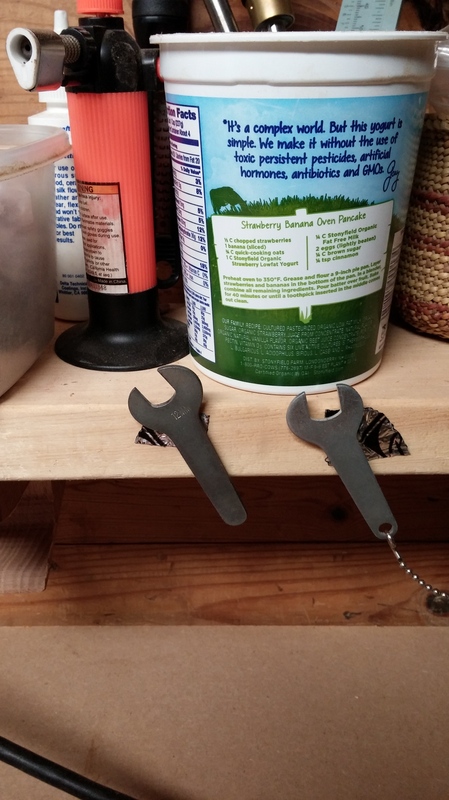 key to change drill press bits was on table somewhere near the drill press, now its usually still somewhere on the table near the drill press, but I can hang it here if I just learn the new habit! I don’t really use these like I thought I would. But maybe that’s cause they were always impossible to find laying flat and invisible in something or on something. Now magnetted to shelf in front of me. If you have seen my previous posts, you may know that my husband and I have been away hiking for the past six months or so. What an amazing journey! 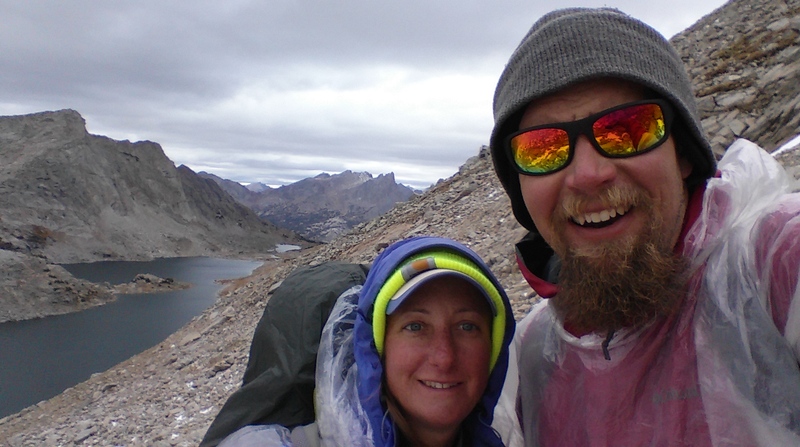 We hiked nearly 3,000 miles from Mexico to Canada over the Continental Divide trail. I had plenty of time to think up some new plans and ideas for the coming year. 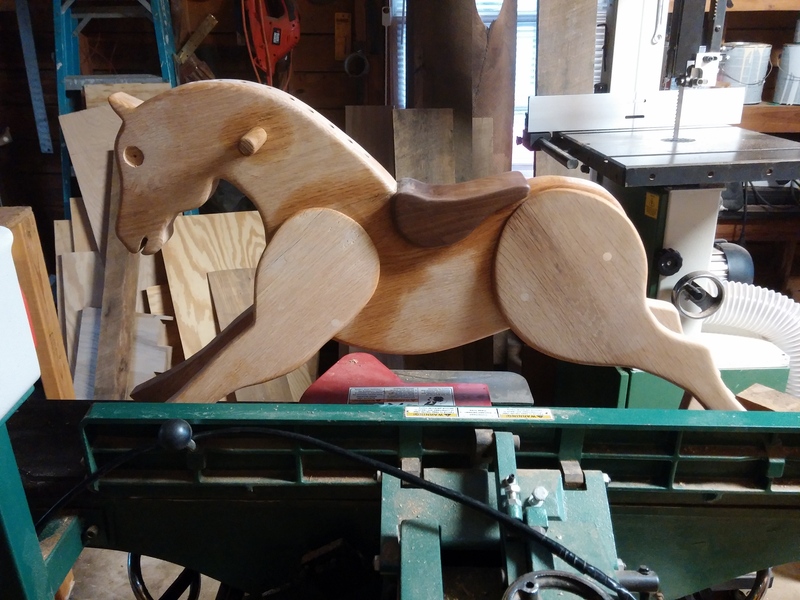 My main goals are to refine my three most popular rocking horse styles, to make one new rocking horse design each year, to continue carving smaller equine related art pieces, and to carve commissioned portraits of your horses. So I became official late last year, but I recently learned that I now have an artist page on the Piedmont Craftsmen website. Exciting! You can get to it by clicking this link. It was created and written by the Piedmont staff, I think based on some of my application information. It is a real privilege to be part of this group and receive some of their marketing tools. I will have a few pieces in the New Members show throughout March, and hope to have at least one thing in the gallery as well. Check out my site and the other new artists as well!